2 way switching means having two or more switches in different locations to control one lamp. They are wired so that operation of either switch will control the light. This arrangement is often found in stairways, with one switch upstairs and one switch downstairs or in long hallways with a switch at either end. Here we have a two way switching system that utilises two single gang two-way switches and a three wire control, shown in the new harmonised cable colours. It is possible to achieve a similar result using a two wire control which, although it saves on cable, is not recommended. This is the preferred approach. Here we a have a schematic (Fig 1) which makes it easy to visualise how this circuit works. In this state the lamp is off, changing the position of either switch will switch the live to the lamp turning it on. If you now change the position of the other switch the circuit is broken once again. Fig 2 below shows how we achieve this configuration. Just like any loop-in loop-out radial circuit, the switch cable from the ceiling rose contains two wires, a permanent live and a switched live. This is cable C below, one wire connects to L1 and the other to L2 on the top switch. 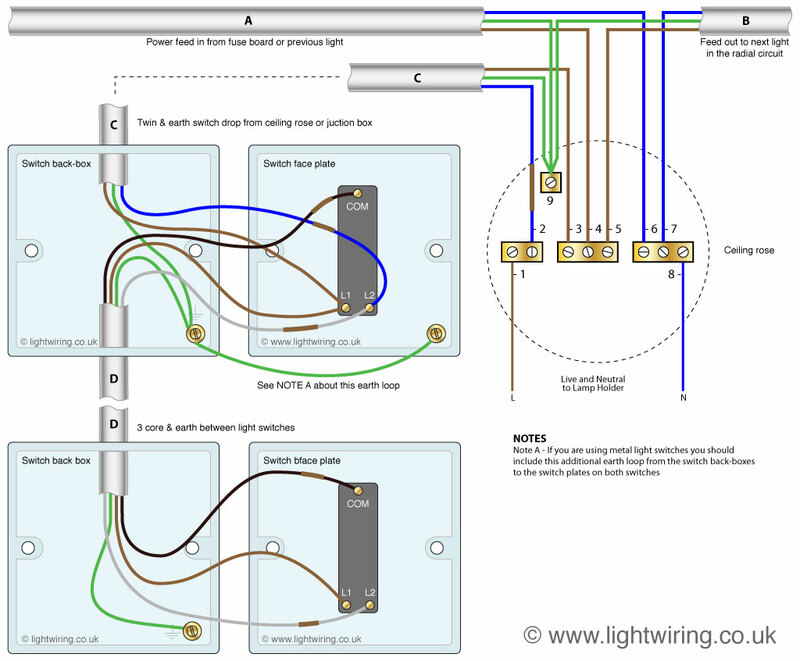 Cable D (Fig 2) is a three core and earth, this is the ‘3 wire control’ that links the two light switches together. COM on the first switch connects to COM on the second switch, L1 on the first switch connects to L1 on the second, and L2 on the first switch connects to L2 on the second. NOTE: The Grey wire in cable ‘D’ is a switched live and the Blue wire in cable ‘C’ and Black wire in cable ‘D’ are permanent lives and thus should be marked with brown sheathing at each end as shown.